Bedside tables don’t necessarily come to mind as one of the more hard to find pieces of furniture for you home….but let me tell you….I’ve been on a journey to find something! When I first moved to town, I decided I needed up advance my furniture situation. I needed a bedside table….among other things. I had been using a “standard height” bedside table that I snagged for cheap at Walmart when I was in college, but it looked really awkward. The height difference was really the issue. A standard height bedside table comes maybe halfway up my bed?! Halfway might only be generous to the standard height table. It really created the need to dangle off the side of the bed every morning to shut off the alarm clock, and there was no way to scroll through your phone comfortably while ensuring it was plugged in and charging. Ya know…..the things that early 20 somethings care about! The size of bedroom in my first rental townhouse really dictated the width and depth restrictions of a new replacement table, and I found one at the World Market. It was on that day….approximately 8 years ago that I made a fateful error….I only bought one table! It’s maybe important to clarify why even finding that first table was such a struggle. I have my bed mounted on legs, it isn’t sitting on any sort of frame. The legs screw directly into brackets that are mounted to the bottom of my box spring. You’re probably thinking to yourself, just put shorter legs on your bed….problem solved. The issue with dropping my bed back down to a “normal” height is that Madam Scout a Roo prefers to sleep and hide under the bed. It’s become her safe space over the years, and watching her try and hide herself under a bed of regular height is just very sad. She usually just ends up wedging herself in up to her shoulders and then just crying and shaking cuz her lil booty remains exposed to the terrors of the world….usually thunderstorms. Once I purchased and moved into Casa MisHappenings I suddenly had so much more bedroom space to be taken up! I’ve been on the hunt for a table with varying degrees of intensity for at least 4 YEARS! In the meantime I was using a piece of painted press board on top of a luggage trunk flipped on end. It was functional, but small and a bit ugly in the far corner. It was semi easy to ignore because my tall bed obscured the view of it for the most part. Tall beds….hiding ugly things in the corner and allowing for safe pupper caves….two birds one stone! After looking at several dud tables that were too tall, too small, too wide, or the worst…..too expensive…Momma MisHappenings came through with an epic Facebook Market find! It was the wrong color, and sitting right on the knife edge of being too wide….but otherwise it was perfect! 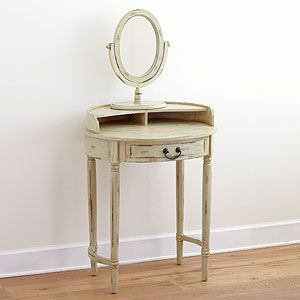 You’ll notice it has a small front drawer …much like my round vanity stand. It has long, spindly little legs…oddly similar to my vanity stand. It struck me as enough similar to seem complimentary, but enough different to still pull off the difference between His and Her sides. And…the price was pretty decent. It wasn’t great especially because I needed to repaint it, and the build of the table isn’t the highest quality, but it was too good to let slide. A few hours in the garage, 2 coats of chalk paint and some waxing elbow grease later, and The Engineer has a new, spacious bedside table. I wasn’t sure about the color I put on it…it was just so I had leftover from a previous project. Once it’s all in and finished I actually really like it. I think I might repaint mine to match this Spring. My vanity started out a sort of distressed mint green. I repainted it with Annie Sloan chalk paint in Old White a couple years ago…and I’ve always hated it! I feel like I can still see the green peaking through for whatever reason and I’ve just never liked it. My stash of Old White had gone bad, so I used French Linen on The Engineer’s. It’s so much better! I was worried it would clash with the paint colors in the bedroom, but it blends nicely I think! Repainting mine to match would really help pull the room together. Different tables in the same color seems better than different tables in different colors. The next project is to remember to stain The Engineer’s table organizer next time I have the stain open. I just keep forgetting, but if you ever feel like you need a way to wrangle up and contain your pocket contents, chargers, and other miscellaneous items I would totally recommend one of these. I snagged this one off Amazon. It’s really helped keep his side looking neat and tidy…it might honestly be neater than my side. I should maybe work on that! Here’s a lovely little photo outtake courtesy of Madam Scout-a-Roo!